So I just got back from the Midwest Freethought Conference. It was a blast! I met a lot of old friends and made a few new ones. The speakers were great, and the conversation was better. 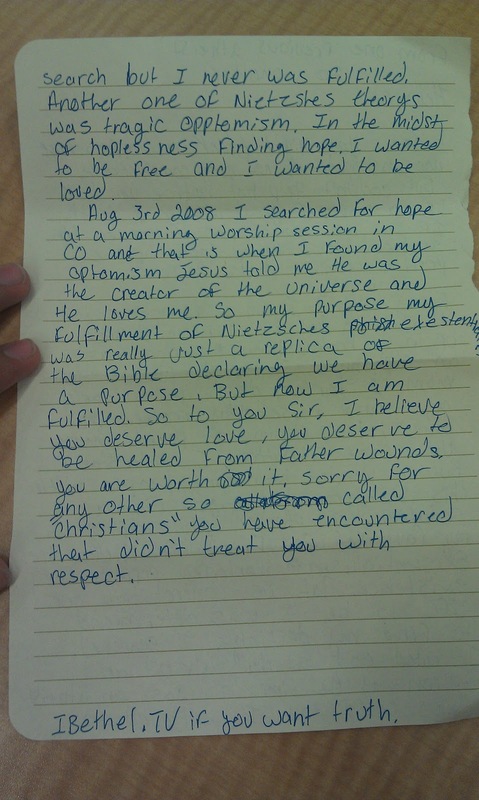 My friend Josh was at a Starbucks wearing a "Born Again Atheist" t-shirt Sunday morning, when a young woman walked over and handed him this letter. Apparently she had seen the shirt and wanted to do something about it. 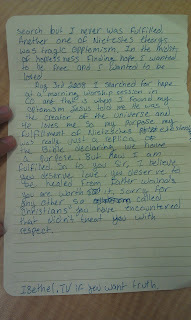 From one previous atheist to another. I know you might think me approaching you was rude or not very comfortable. But couldn't help but notice you look like a man of great wisdom & truth. If you are curious or if you like science you should look up the protein Laminin & its purpose. search but I never was fulfilled. Another one of Nietzshes theorys was tragic opptemism. In the midst of hoplessness finding hope. I wanted to be free and I wanted to be loved. Aug 3rd, 2008 I searched for hope at a morning worship session in CO and that is when I found my optomism Jesus told me He was the creator of the universe and He loves me. So my purpose my fulfillment of Nietzsches exestentialism was really just a replica of the Bible declaring we have a purpose. But now I am fulfilled. So to you sir, I believe you deserve love, you deserve to be healed from Father wounds you are worth it. Sorry for any other so called "Christians" you have encountered that didn't treat you with respect. IBethel.TV if you want truth. I'm not even sure where to begin. I'm willing to forgive all of the spelling and grammar because it was a hastily hand-written note and I doubt I could have done better without spell-check. My first facepalm was "Laminin & its purpose". Laminin is a protein that helps keep our bodies from falling apart into a lump of cells. What this letter is probably referring to is this Sermon by Louie Giglio where he gets really excited because Laminin can be drawn in the shape of a cross. Credit to potholer54 for this summary and response. Isn't that amazing! A protein that doesn't actually look like a cross but can be drawn that way in a textbook holds our bodies together! Praise Jesus! What's even more unbelievable is that even Answers in Genesis thinks this is a bad idea. I'll skip over the whole Nietzsche bit because frankly I'm not as familiar with existentialism as I should be. 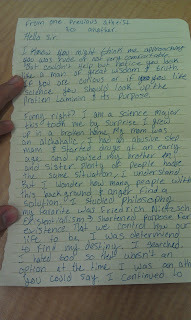 I will say however that her search for "destiny" doesn't gel with my (albeit limited) reading of Nietzsche. 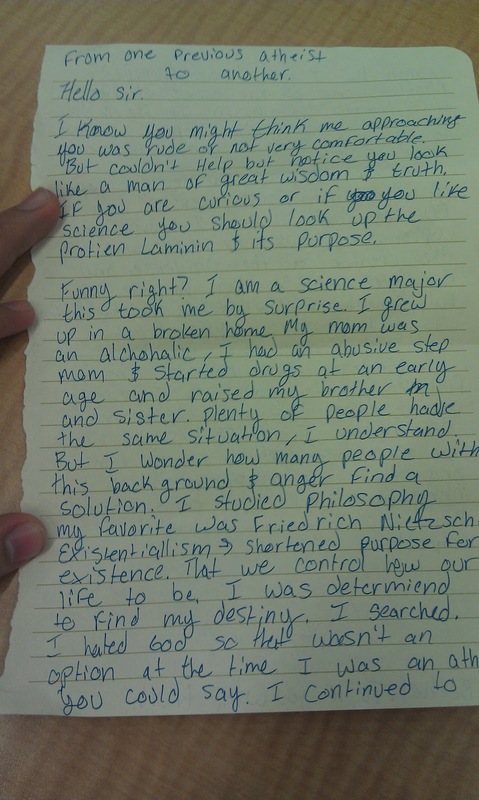 I hated God so that wasn't an option at the time I was an atheist you could say. No I couldn't say that. You can't be an atheist AND hate God. You can hate the character as portrayed in scripture, you can disagree or even hate the morality that people attribute to it, but you can't hate God. Remember, we don't believe God exists. Hating a nonexistent being is at the very least a waste of time. This fatal yet common mistake is so often repeated by self-proclaimed former atheists that it's become a sort of smell test. "So to you sir, I believe you deserve love, you deserve to be healed from Father wounds you are worth it. Sorry for any other so called "Christians" you have encountered that didn't treat you with respect." Not sure what "Father wounds" means, but it definitely implies that Josh is an atheist because he was wounded by something, probably by "so called 'Christians'". Not only is this a no-true Scotsman fallacy, but it actually disrespects Josh in the process. By implying that as an atheist that he hates God and/or was turned off from God by phony "Christians" who treated him poorly, you are not respecting his ability to come to his own conclusions through reason and evidence. Did it ever occur to you that he might have good reasons to not believe in God? You yourself said he looked like "a man of great wisdom and truth." I know that you are trying to show true Christian love and compassion but it comes laced with pity and condescension. The Christian view that we are broken and without love if we don't have God in our life is NOT respectful. It's not even nice! They/you lost me at 'funny right?'. There was nothing said in the previous paragraph that was humorous. people who think about what they're saying and why.